Knitting Relaxes Me: Good stuff! 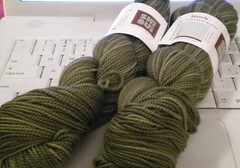 As I mentioned yesterday, I visited two yarn shops on Saturday. My plan was to buy only things I couldn't easily get at my local yarn shops. I had been to Needleworks in Champaign before, and was very impressed with their selection and the friendliness of the staff. They were really busy this time, which is a good thing! 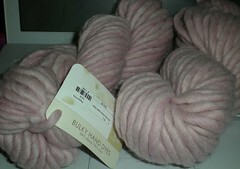 I concentrated on sock yarn this visit. I also picked up a couple more row counters, some Knit Klips, a bag of Clover needle coils (which I love for holding circs together when they're in my bag), and a little bottle of Soak in the Flora scent. Yarn Barn in San Antonio had a great accessories wall, which I didn't appreciate until I moved! After meeting my cousin for lunch and a trip to Hobby Lobby, where we looked at garland and mirrors and boxes, I went to Klose Knit in Urbana. Klose Knit reminded me of Hill Country Weavers in Austin, mostly, I guess, because it's located in an old house, although it's much smaller than HCW. They have a nice selection of yarns, ranging from fairly standard (Rowan) to less common. I went for a couple skeins of the less common. This is going to be a hat, probably for my niece. This is gorgeous (and was on sale for 30% off!) but I have not idea what I'll do with it. I also bought a set of size 1 ChiaoGoo needles and the Holiday Gifts issue of IK, which seems to be sold out everywhere else. I'll definitely visit both of these yarn shops again! Wow! Yummy stuff. Gee, glad I got my holiday IK early. Wow, I bought size 1 ChiaGoos too... but couldn't FIND the Holiday IK that I sought. How'd that work? you were there Saturday right? I was there Friday and no one knew where it was! The Yarn Barn really does have a great accessories wall. I think that every time I'm in another LYS and they're out of one needle size or another. 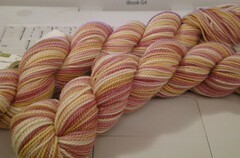 Pretty yarns! If you don't have enough time to knit up all those delicious yarns, I'll be very happy to take them off your hands. Really.